Phil Fisher Gallery - Welcome! Whether visiting, living in, or soon to make Naples your home, Phil Fisher Gallery is the Naples art gallery to include on your "must see" list! Phil Fisher is one of Naples' most recognized and popular artists. 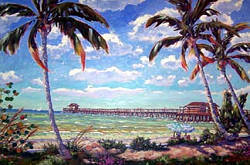 He has lived and painted in South Florida for over 40 years. Many of his watercolors and oils boast images of Naples' character and charm, including the coastal aspects as well as the Everglades and it's wildlife. He visually interprets his experiences of geographical locations in a positive and colorful way and therefore, is included in a number of prestigious corporate and private collections around the world. You may recognize his images that grace the covers of numerous publications and books. "I like to think of my paintings as a sanctuary for those whom feel anesthesized by technology." Phil can be found painting daily in his studio/gallery in Crayton Cove or out on location, in various inspirational spots around town. Crayton Cove, in Old Naples, has become a cultural destination in recent years, especially. It retains the historic appeal that has attracted many of us to Naples for years. Phil Fisher Gallery along with Guess-Fisher Gallery are the anchors for the group of local professional artist/galleries called the Galleries of Crayton Cove, located by the City Dock, on the bay. The group consists of a number of artists and craftsmen working in a variety of mediums, showcasing their art within a one block radius, intermingled with a handful of the best restaurants Naples has to offer. 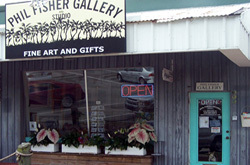 Guess-Fisher Gallery is located in the back of Phil Fisher Gallery, offering 29 years of experience in custom picture framing, fine art, gifts and the working studio space of Natalie Guess, a fine art batik artist for over 32 years. Her gallery/studio offers the art enthusiast the opportunity to see the batik process in various stage, which helps to understand it's unique appeal. She has taken this ancient medium, more common in countries such as Africa and Indonesia, and pushed its boundaries in the world of fine art. Her work can be found in numerous books, publications and world-wide collections. Her handling of fiber in batik as a fine as form is pioneering a unique niche within the Naples art world, and beyond. Their galleries offer inspirational renditions of the paradise we experience in Naples and the opportunity to take home a lasting memory created by one of Naples' finest artists. Please come by and enjoy a leisurely visit.